Parakeets need more than seeds to stay fit and healthy. While parakeets love seeds, veggies and dried fruits, fresh fruits also give your bird necessary vitamins and nutrients. Choosing fresh fruit helps you avoid the preservatives and dyes that are sometimes found in dried fruit, and preparing them properly ensures your bird will always gobble up this healthy snack. Choose an assortment of fruits to start out. Parakeets have varying tastes, so give your bird some options. That way you can see what he prefers and stick with it in the future. Try an assortment of both soft and crunchy fruits, like strawberries and apples. Include orange fruits like apricots and mangos, as they are particularly loaded with helpful beta-carotene. Cut up any fruits that have seeds, like apples, and remove the seeds. While tiny seeds like those in strawberries are safe, bigger ones are unhealthy for parakeets. Cutting the apple into slices makes it easier for your bird to dig in. Microwave the fruit to warm it up. While birds find normal fresh fruits appetizing, warm fruits are nearly irresistible. Offer the fruit mix in a dish next to your bird's water dish. Birds often like to dip their food in water, so for his own convenience keep them side by side. Remove any uneaten fruit at the end of the day so they don't go bad inside the cage. Remember to change his water too, since he was probably dunking food in it all day. Repeat this pattern daily until your bird starts eating the fruit. You may find that he eats certain pieces while ignoring others, so give him what he likes. If he continually ignores his fruit, he may feel bored by it. 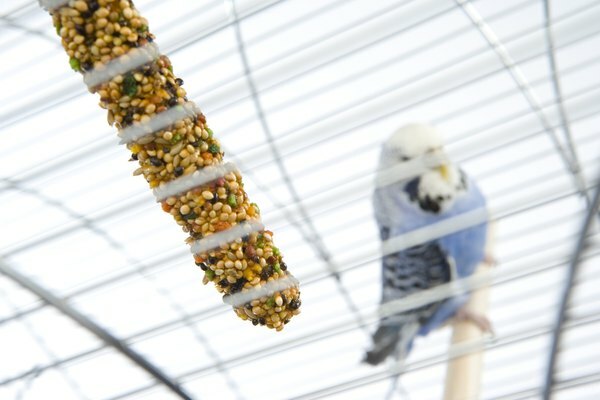 Liven things up by skewering it to make a fruit kabob, or dangle it from the top of his cage to make eating more exciting. What Kind of Food Can You Give a Parakeet? Why Does My Parakeet Use a Cuttlebone? Can I Give a Parakeet Dry Fruits? What Else Do Parakeets Eat Besides Seeds? What Does a Parakeet Eat?